Aizawl, Dec 2 : The performance of the Voter Verifiable Paper Audit Trail (VVPAT) system used in the recently held Mizoram assembly election was not satisfactory, as 10 per cent of the machines malfunctioned, state Chief Electoral Officer Ashwani Kumar said here today. 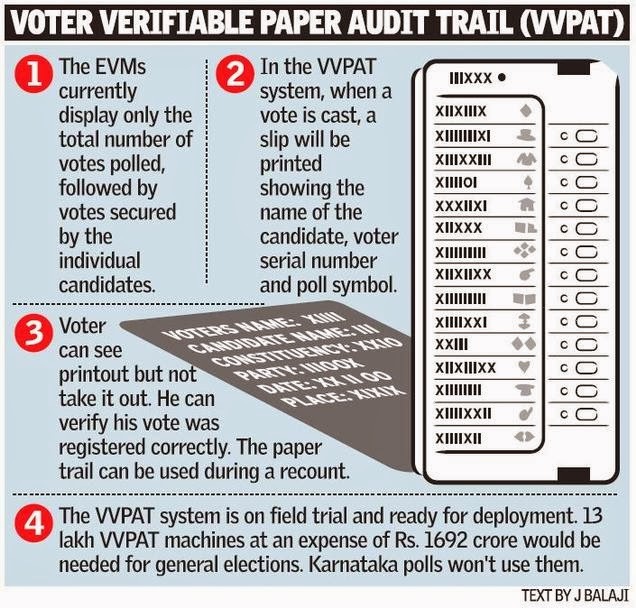 The VVPAT is a machine attached to EVMs which allows voters to check if their votes are cast the way they wished. For the first time in the country in Assembly polls, VVPAT was used in Mizoram on November 25 when 21 VVPATs out of 217 used in the polling were found defective. "Twenty one defective VVPATs among 217 is very high in percentage. The matter was reported to the Election Commission," Kumar told a press conference. The EC has invited officials of the Electronics Corporation of India Limited (ECIL), which manufactured the machines, for a discussion on the matter on December three at Nirvachan Sadan in New Delhi, he said. The defective VVPATs were taken to the ECIL headquarters by a technician sent by the Corporation. EVMs with VVPAT system were used in 10 assembly constituencies within Aizawl city limits where 217 VVPATs were used in the polls. Altogether 300 sets had been sent to the state. Officials from the ECIL and trained personnel were present in the polling stations where VVPATs were used. VVPAT was first experimented in an assembly bypoll in Nagaland in September.